We spend 70% of our time at work. Mine was probably closer to 90%. Make no mistake, this is not a diatribe of self-proclaimed “grit”, a word all too frequent on our Instagram feeds. It’s just a fact. That’s the real point. Everyone’s working hard, everyone’s working late, and everyone loves it. Working passionately, excessively, and often to a point of physical sacrifice, is a defining component of the modern workplace, especially for millennials. We champion hustle culture, a “rise and grind” mentality and re-tweet billion-dollar entrepreneurs who glorify 80-hour work weeks, Ambien dependency and performance-enhancing psychedelics. I happened to be in an understaffed office, the only one under 25, and with something to prove. Corporate America calls this a “lean” business. The first time I heard this, I imagined a trading floor with overly-fit 50-somethings working hard to close deals and even harder in the gym. I was wrong. If you hear this in your next interview, consider it with a reverse correlation to low body fat, full hairlines, and mental sanity. It’s funny what a lack of sleep will do to your brain! Simple tasks seem nauseatingly complex, loved ones are adversaries and your time, and how you choose to spend it, becomes increasingly self-important. Not sleeping, and all the discomfort will drive you to question what you’re really doing: your career choices, your essence, and even your spirituality. My lack of sleep led me to Buddhism with a hope I would find the greater meaning beyond my stressed-out self, the professional rat race and a daily 16-hour grind. While I can’t say it has all the answers, it introduced me to an ancient practice grounded on fundamentals of introspection, self-awareness, and disconnection. Meditation truly changed my life. By taking a few minutes to sit with my thoughts, watch objectively as they pass and focus on my breathing as a point of detachment from chaotic internal chatter, I was hit with sensations of restoration, clarity, and acceptance. I was also surprised at the growing amount of research linking meditation to improvements in physical health. Reports from the American Psychological Association connected meditation to decreased symptoms of depression, anxiety, and insomnia. The Mayo Clinic found a correlation to improved cardiovascular function, lower blood pressure and a decreased chance of heart failure. Harvard also concluded a daily practice can lower the effects of longevity, dementia and Alzheimer’s disease. Like nearly 26 million other people, I downloaded the meditation app Calm and became enamored with its user experience, soothing sound and impact of its content. It created a convenient venue to develop a regular practice, regardless of work-life balance, to learn, develop and appreciate a newfound aptitude that was quickly improving my quality of life. The only challenge was finding a place at work. I would try to meditate before but I was waking up at an already ungodly hour and finding time after 11 pm was next to impossible. Meditating in empty conference rooms seemed logical, I was just awkwardly interrupted by colleagues, and doing it out in the open, or at my desk, seemed a bit too outwardly “zen”. I began regularly retreating, usually a few minutes after I arrived, to my car. But, mornings quickly became too chaotic that as soon as I showed my face, it was hard to get out of dodge and being gone, even for fifteen minutes, would have raised “questions” in a high-attrition environment. What became more frequent, was meditating alone at night, in my car, in the garage. In order to get Calm through the Bluetooth, I had to keep the car running. I didn’t realize the picture I was painting until 1:47 am on a Wednesday when a 71-year old parking attendant, furiously pounded on my window attempting to pry the door off as if the car was trapped at the bottom of the Hudson in January quickly filling with icy water. After reassuring a new friend, and the epitome of a good Samaritan, I realized the absurdity far-extended the embarrassing situation. How did it make any sense that offices are stocked with amenities like nap rooms, ping-pong tables, and craft beer but there was nothing for the preservation of mental health, balance, or personal sustainability? I was trying to work harder, not escape my job, by taking time for myself to later return with a renewed sense of focus. What began as an inquiry set up the foundation for a deeper vision. I imagined a future workplace to not just pursue careers, but also mental and emotional wellbeing. All of this stemming from a unique product that answered my demand, and what turned out to be the needs of many others, for dedicated physical space powered by all the benefits of health-tech, artificial intelligence, and app-based meditation. Taking this one step further, what if that space and that technology got to know you personally? It knew everything important to you from a deeply intimate standpoint. Things like getting better sleep, being more creative or having better relationships. And, imagine if it acted as a friend for your brain, right at work, and helped you achieve those goals and become the person you’ve always wanted to be? Think what that would do for yourself, your friends and your business? That’s why we founded Pause. We’re working on a smart space that’s your sanctuary at work, not to escape, but to improve. If you’re working hard, you deserve it. Why put your health on hold for the sake of your career? Doesn’t that seem like an utterly illogical paradox? Isn’t health at the end of the day, next to family and friends, all we really have? Another question I ask hard-working people is what if you actually felt better after your workday? Sounds crazy, right? It’s definitely unusual but in a few months, we think it’s possible. Especially with content from award-winning providers and smart programming, we’ll let you identify what is important and will empower you with the tools to get there. We’ll even show you the biofeedback that it’s working. And, the best part is that all of this is available in one convenient location that you can return as it suits your busy schedule. 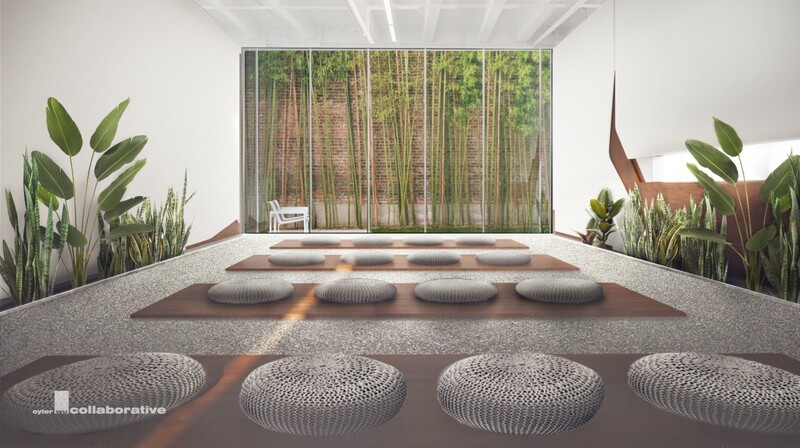 Our hope is that by building these spaces geared to your wellbeing, we’ll change your life just like meditation changed mine, with greater outcomes for you, your colleagues and the world around us. We spend 70% of our life at work. Let’s make it worth it.